Virginia is one of America’s oldest cities, yet it’s also – to a certain degree – outwith the standard hub for new music. Perhaps that’s why it has fostered such a rich creative community. It’s relatively cheap to live there in comparison to the average metropolis, and it’s well connected, too – virtually slap bang on the Mason-Dixon line. Earlier this year, Clash began to hear rumblings about a new artist from Virginia, and her wonderful debut record. Lucy Dacus has just started her 20s, yet already her work is emotionally rich and melodically secure, displaying a warm, witty sense of daring that would shame much older peers. Debut album ‘No Burden’ was recorded alongside close friends Collin Pastore and Jacob Blizard was initially only given a digital release, but word soon spread. 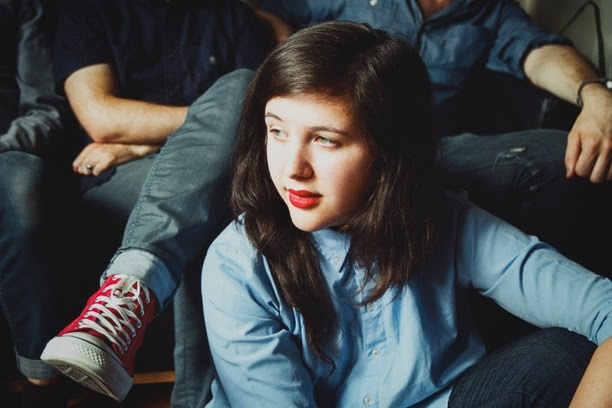 Matador picked up the record, allowing Lucy Dacus the support to get her music heard. Yes, I was born 20 minutes north of Richmond in the suburbs. It’s more a rural area. Like next to our area there are cornfields in a suburb, pretty much an area between those two. But yeah pretty much Richmond my whole life. What is Richmond actually like? Is it an artistic hub? There’s an incredible scene there is a lot of creative and productive people. The problem is there are not a lot of people who leave Richmond with their ideas. Bands don’t tour that often. Part of what I’ve been trying to do is be like: hey guys, it is possible to go out and share the awesome stuff you make! I try to encourage my friends and bands to tour and I really hope people start to catch on to what Richmond has to offer. Do you think that Richmond’s atmosphere, creativity and collaboration has helped quite a lot in terms of your own work? Oh yeah, absolutely. I wouldn’t have started playing shows if I hadn’t been encouraged insistently by friends of mine who play music as well. I use to go to maybe five shows a week. When did you begin writing the material for your debut record? The first song that I wrote was ‘Trust’ and I guess that was written in the fall of 2013. I never thought that it would become an album - I was just writing songs because that is just what I did. There wasn’t really an intention for them to be compiled and put together. They all have something in common because I wrote them, but it wasn’t like the album was a concept. So what is the songwriting process like for you? Usually like writing songs is pretty quick. Usually what will happen is: I will go on a walk. Ideas will start coming. It’ll be like half an hour later and the song is done, then I’ll get home and write it all down. These days touring is harder. I’ll write a verse and it’ll sit for months because there is no time to sit down with a guitar a lone and figure it out. But it is still a constant thing which is happening in my head and coming up with lyrics, because lyrics are always first. Do you go for a walk just to get into that relaxed state of mind? Yes and it’s not even like I’m going on a walk to write lyrics. I’m walking from my house to the coffee shop, or my friend’s house to home and that’s just where my mind goes. How did you come to work with Colin Pastory? We’ve been friends since high school and we used to make records in his room. On his laptop... That’s just how we hung out. Colin went to Berkley to study recording, then moved to Nashville. So he works at a couple of studios in Nashville. So he kind of shipped over Richmond and he hasn’t done a tonne of work. He does really good work in Nashville and that’s where we went to record as well. How long were you in Nashville for? Did you go for a week and try to rattle through as much as you could? It was like two weeks. The first week we probably had like four rehearsals, because I was solo up until then and had never played with a band. We wrote all the parts for the album in four practices. Then recorded most of the album in one day. It was kind of a rush job, we didn’t have a lot of time what with jobs and school and only having the studio for one day... we kind of had to make it work. Listening to the record reveals an emotional edge. You’re very open as a song writer - is that something that comes naturally? Yes that’s a really good trait. I’m glad that comes across. It’s honestly like the easiest way to write. I think it would be really difficult for me to pretend. I don’t know if I’m capable of writing something that isn’t open because closing off would take more energy for me because I have just basically tried to form my life around being honesty and not. I don’t want to put out something that isn’t true to me or couldn’t be true to other people, so it’s really the easiest way to write for me. No matter how kind of bracing or downbeat there is always this kind of upbeat note. Do you think that’s another hallmark of your work? Resolution is the goal in terms of being a human, engaging with art. Either asking the right questions, answering questions. Just giving us all options, encouraging thought, openness and hopefully becoming content that’s a lot to ask. But I mean when you have the opportunity to show your words to so many people I just feel that responsibility. Do you think you’re an optimist? Yes! The phrase I would say is posi-nihilism. Optimistic-nihilism. Just accepting that all the bad in the world and also accepting that it will all end kind of coming to peace with the fact of death. This is like a huge part of what I think about and definitely what I think the next album will be about. because then once you’ve done that then life can be a lot more fun and you can be more optimistic. The record has been out for a while digitally and then Matador has come in and it will get a full re-release. Matador contacted us maybe it was the week before or the week after the album came out. Gerard (Cosloy, label manager) emailed me, to my personal email and I was like: whoa! I’ve been familiar with Matador what feels like my whole life - probably not when I was a toddler but since I started liking music it was Matador artists. You briefly touched on the fact that you’re looking ahead to next the next record. With the staggered nature of this release, are you anxious already to get beyond this and start working on something fresh? Yes I think that all the upcoming songs that we are writing we all feel more excited about it, it’s not that we don’t like the songs from ‘No Burden’ we still enjoy playing them every night but the next record the content is more true to what I’m feeling now, the arrangements are with a band in mind. All the songs on ‘No Burden’ I wrote to play solo then we put the all the parts in afterwards. The rest of the upcoming stuff, I’m like 'oh the drums should do this here' or sometimes I’ll write a bass part. So yeah I think it’s going to be a lot more intentional, fuller. I think I’m going to have a bigger production role in the next album. So plans are already afoot? But right now you’re just enjoying the UK – what has it been like to take this material out on the road? I feel like the biggest change has been realising that it isn’t mine. The music isn’t specific to me. Hearing how other people have reacted to it, what other people get out of it… that’s equally as legitimate to what it means to me. It’s kind of that fear, but also faithfulness that when you let it out into the world and release it, it has a life of its own. 'No Burden' is out now.